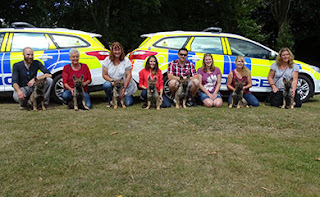 Now that the D litter have had all of their injections we all met up at HQ Middlemoor for our first training session on a very hot sunny day. 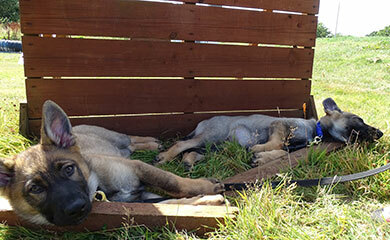 There were 9 pups in the litter and as we only needed 6 for our program we sold 3 pups. 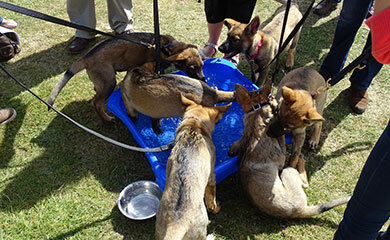 The 3 pups were sold to pet homes. 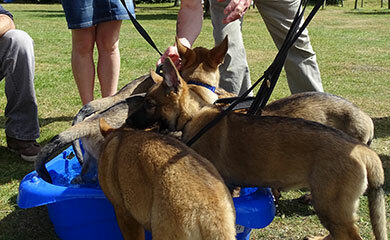 Dot ( Now Zena ) Darcy and Dora ( Now Pepper ) have all settled into their new homes and they are having a great time. I follow Darcy and Pepper on twitter. 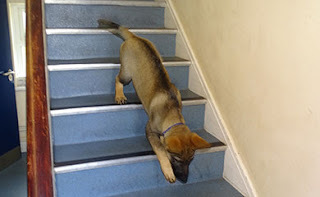 We started at the dog training school to see how the pups got on going up and down the steep metal lined stairs which is always a good indicator of their level of adventure and confidence. Here is Devon making it all look very easy indeed. 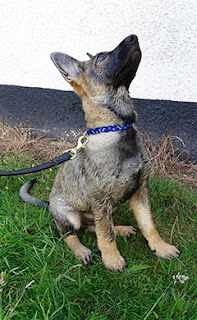 I have informed the 3 owners of Zena, Darcy & Pepper that although I cannot train their pups they are always welcome to meet up with their littermates for socialisation which will be good for them and I am always available to all of them for any advice. All of the pups went up and down the stairs very easily and with confidence without coaxing which is the first time I have known that to happen. 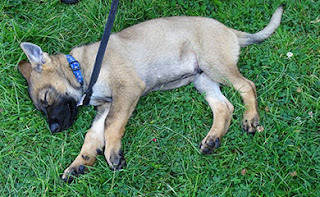 Here is Danno finding it all very easy. 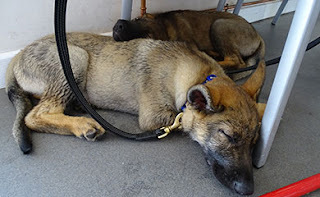 Obviously it is not a good idea to allow the pups to be running continually up and down stairs at home as it is not good for hips or elbows. 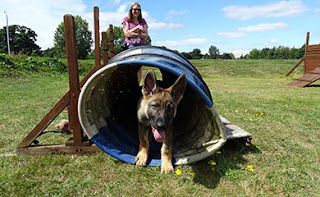 Then it was off to the agility area to introduce the pups to the ramps and the tunnel. 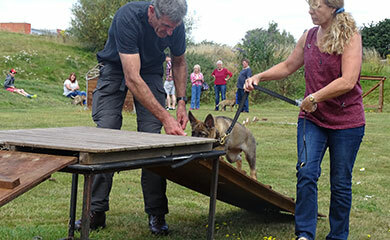 Obviously agility involving jumping is not carried out at this age but negotiating obstacles and different tunnels is good for confidence building. 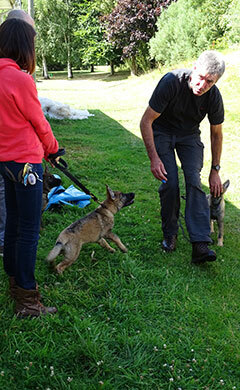 Here is Daisy showing intense concentration on Obstacle 2. 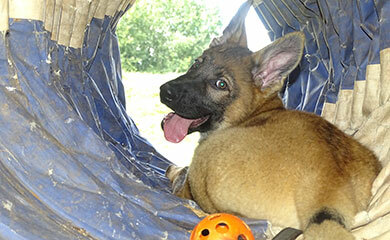 All the pups loved the tunnel and some of them like Devon wouldn’t come out because it was cooler inside than outside. 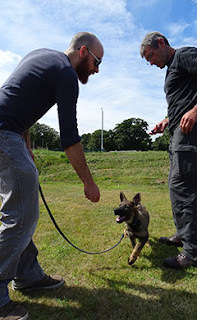 But we eventually got him out. By now some of the pups were starting to wilt in the warm conditions. We then went to a nice shady area to introduce some basic obedience exercises for the walkers to practise with their pups over the weeks ahead. 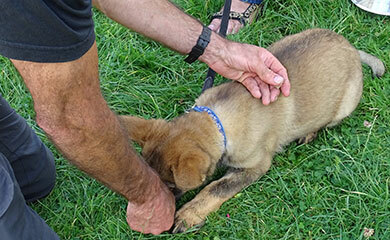 Using my favourite liver and garlic titbits I introduced the sit, the down, the recall, and heelwork. We had a discussion about socialisation, meeting other dogs, the value of grooming and any general questions the walkers had. 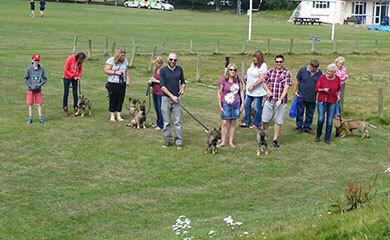 We all then went into the pavilion for refreshments. I had planned on giving an input on how to groom their pups but the pups gave me some subtle clues that it was time for everyone to go home. 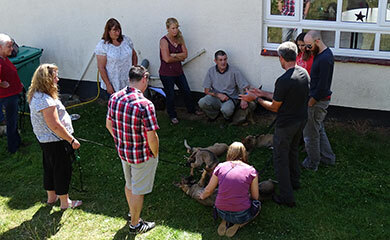 When we next meet in 2 weeks time we will introduce tracking and article searching. 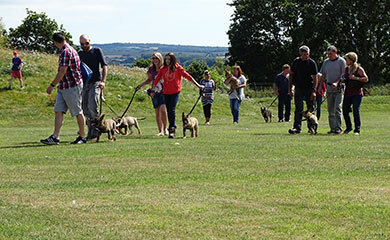 Our puppy walkers are the glue that holds the puppy scheme together and without them the handlers would not get the quality dogs that they do. 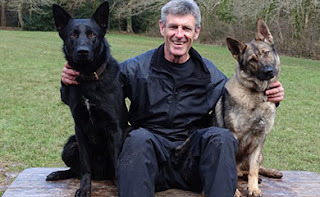 Jill and husband Terry have puppy walked numerous dogs for us and I regularly bump into Jill in Exeter on a Saturday morning taking Ronny on her bank run which for her is easily a mile round trip from home. 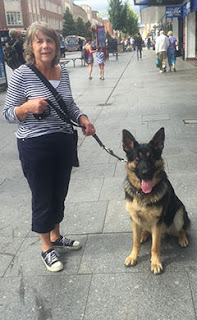 Ronny is a big powerful 12 month old dog and last Saturday I saw her walking him calmly past 2 very aggressive dogs in the high street without any difficulty whatsoever. I was very proud to watch them both. Jill maybe small and now 70 but she would put some of our handlers to shame. Well done Jill. Next week I will update you on how all of our other pups and dogs are doing as we approach the September Initial Police dog course.